Donnington Valley is a large, modern hotel just near the M4. The surrounding Berkshire countryside makes it a quiet but accessible retreat. There's an 18-metre pool, steam room, sauna and aroma room downstairs, where the modern white design complements the bold artwork on the walls. Upstairs is a much more relaxed spa area decked out in cool, earthy tones. The good service, decadent treatments, incredibly peaceful upstairs area, and lovely terrace make for a very enjoyable spa day. Turn off the M4 and drive into the hilly parkland landscape of Donnington Valley, so beautifully kept and green, it is almost hyper-real. The hotel is a two-storey red-brick modern building with a faux country-manor wood-panelled interior. The spa and health club are at the end of the west wing of the hotel. The open plan, minimalist all-white reception has windows letting in lots of natural daylight. To the front is a café overlooking the bright and stylish pool. Striking modern artwork adorns the walls, while lemon trees in the pool area and a cactus in the café hint at the owner's Californian connections. The spa is set over two levels. The first floor, your entry point, holds the facilities, which are shared with health-club members. Upstairs is the quieter treatment area. The changing rooms are spacious, with large wooden lockers and benches, plus three private changing cubicles. They feel functional rather than luxurious (and could do with a re-varnish) but there is The White Company shampoo, body wash and conditioner in the showers, and body lotion on the vanity station. A curved mosaic wall takes you to the pool area, which is large, bright and modern with floor-to-ceiling windows letting in lots of natural light. The 18-metre swimming pool is tiled in deep-blue mosaics and lit with underwater spotlights. Above it, spotlights shine on a cantilevered ceiling from theatrical rigging, creating a stylish glowing effect. Walls are white with three colourful modern-art canvases. You have plenty of loungers to relax on and order drinks from the café. Doors lead to a small outdoor terrace with chairs and tables, while banks of cypress and fir trees provide all-round privacy and greenery. A circular Jacuzzi juts into one side of the pool, with steps either side. It is deep and bubbly with room for four. Behind it are three clean heat rooms and an experience shower. The wooden sauna has three benches and a clear glass door overlooking the pool. The aromatherapy room has a turquoise mosaic bench that could seat ten; warm yourself gently in the low heat, inhaling gentle eucalyptus scents. The steam room is large and dark, hot and steamy, a similar size to the aromatherapy room. Go up the stairs by reception, or take a lift, for treatments and the nail bar. The spacious, bright relaxation room has eight loungers and photos of Sonoma valley in California, where Donnington Valley's owner Sir Peter Michael has a vineyard. Snuggle up under a fleece blanket and help yourself to drinks and magazines. On sunny days, doors open onto a delightful private terrace with high-backed wooden chairs and tables overlooking undulating lawns and trees. We tried a Sonoma Aromatherapy Massage (55 minutes, £73) followed by an Aurabsolu Glow Power Booster Facial (55 minutes, £70) both with Decléor products. I arrived at the front desk where my therapist, Orla, greeted me and led me straight through to the spacious, softly lit treatment room. I sat in a chair while we went through my consultation, then Orla left me to disrobe and lie face down on the treatment bed. When she returned, Orla spread warm Aromessence balm on my back and worked on each side of my body with long, flowing Balinese massage strokes. It was blissful. She massaged my legs, kneading and stretching the muscles until they were putty, repeating the process on the other side. Orla covered me in a blanket and raised the bed slightly to begin the facial. First, she cleansed my face with a thick balm, then a cleansing lotion. She dabbed on a mud gommage, rubbing it off as it dried, removing the rest with warm mitts. She massaged in a warming aromatherapy facial oil, smoothing my forehead and cheeks with firm pressure, and pressing acupressure points on my forehead, scalp and temples. Next, she pasted on a tingly cool enzyme mask and, on top of that, an even cooler gel mask. As this set, Orla massaged my head, shoulders and décolletage, then peeled off the mask before a final cleanse, tone and moisturise. Orla gently roused me, left me to dress, then led me to the relaxation room. My skin felt nourished and radiant from top to toe. The aromatherapy oils smelled divine and I left them on as long as possible, showering them out of my wild post-facial hair in time for dinner. A relaxing treatment and a treat for the skin. Donnington Valley Spa offers a range of Decléor facial, massage and body treatments including scrubs and wraps. It has menus for men, mums to be and new mums. It also has an Aqua Sun room, a massage jet-bath under a low-level UV canopy. Eat in the bright spa café, its outdoor terrace on warmer days, or, as we did, have lunch served by the pool to feel truly spoiled. The menu is extensive with hot, healthy, free-from meals and options to indulge, including cream teas. We ordered a bento box from a choice of earth (vegetarian), water (pescatarian) and land (chicken) menus. Our box contained a mozzarella and tomato salad, pasta pesto, olives, and berries with clotted cream, all fresh and tasty. In the evening, we ate in the 2 AA Rosette Wine Press restaurant, which -- as the name suggests -- has a wine list the size of War and Peace, ranging from by-the-glass to magnums. It's a friendly, informal space, with a delicious seasonal menu; we loved our beautiful salad starter and linguini main, both fresh and not too heavy. Hence, we managed to squeeze in a light lemon cheesecake, too. Relaxing by the pool, gazing at the light and reflected trees glinting on the water, with a spa butler serving us a delicious fresh smoothie. Almost California -- by way of Newbury. The spa staff: Our therapist, spa receptionists and pool butlers were charming and helpful. The sense of space and light, and the impressive collection of modern art and sculptures throughout the spa and hotel. The changing rooms, while clean and functional, need a re-varnish and spruce. 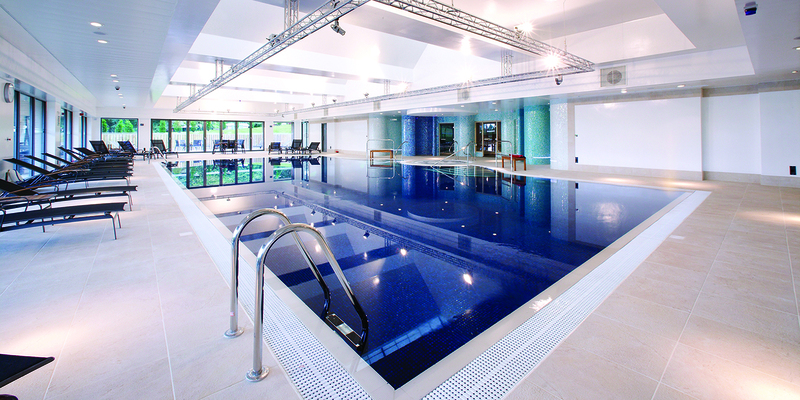 Active and sporty spa-goers: The pool is a good length for swimming, plus there is a good-sized gym, a dance studio, and lots of classes running all day; never mind the 18-hole golf course and nearby Newbury racecourse. Those who love affordable good food and wine: All our food was seasonal and delicious; we adored our breakfast with its DIY waffle iron and 1950s diner-style touches. 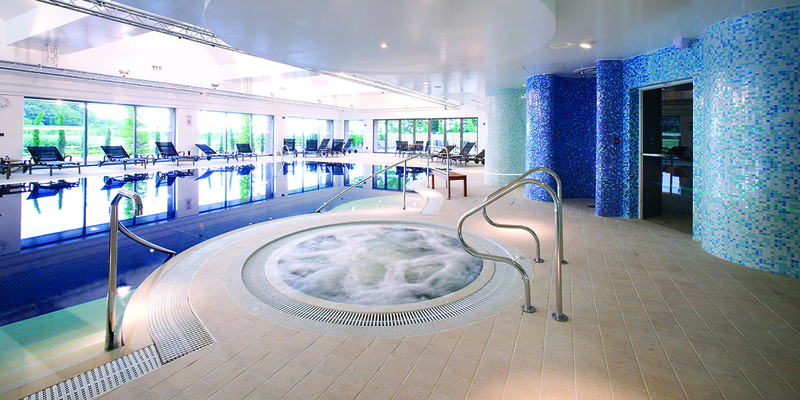 We gave Donnington Valley Spa a Good Spa Guide Bubble rating of 5 bubbles. Spa-goers will feel pampered by the fabulous food, nurturing treatments, and poolside food and drinks, while the health conscious will enjoy the bright modern pool, classes and heat facilities. Savant Spy visited in September 2018 and awarded it 5 Bubbles. "No longer offers Teen Spa days - now limited times and access to pool/treatments for teens and no access to any heat related facilities e.g. saunas"
"The spa staff are great but you should be aware that there are frequent breakdowns of facilities so you may find the sauna or Jacuzzi or other facilities offered out of order. Check on the morning of your arrival! Name"
A healthy spa lunch is included in full spa day packages. 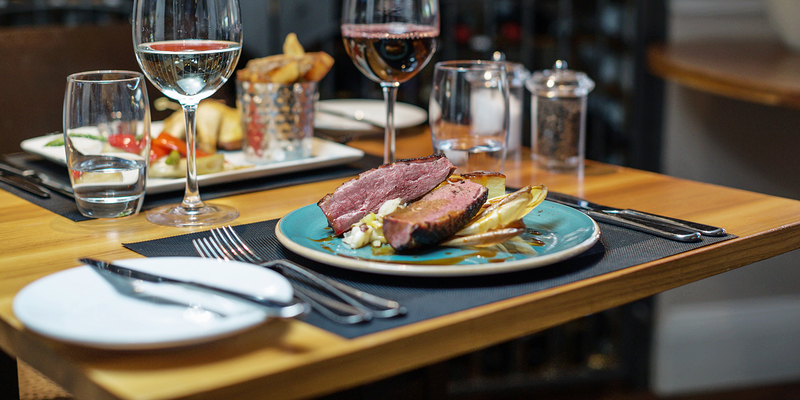 The WinePress Restaurant offers superb food and wines in an intimate, yet informal atmosphere. A lighter ‘Bar + Mezz’ Menu is also available. Classic Double, Executive Double and Suites available in the hotel.